Uzbek authorities make enormous efforts to fix the spoiled country’s reputation: it badly needs new investors instead of those it has had and used already. Tashkent runs a huge PR-campaign: forums, symposiums and even the Art Fashion Week, organized by Gulnara Karimova and her “Culture and Arts Foundation of Uzbekistan. Yet however, the West seems to have no illusions over the true state of things in Uzbekistan and shows its attitude by canceling the fashion show of the president’s daughter in New York, boycotting cotton from Uzbekistan and openly criticizing the existing regime for the numerous reported human rights violations. Foreign investors in Uzbekistan face huge risks, related to, primarily, an unprecedented interference of the government with business and economics. Indeed, some investors do enjoy special privileges, like, for instance, the General Motors in Uzbekistan which has monopolized the automotive market supported by the government of Uzbekistan via exceptionally high protective customs duties over imported vehicles. This is going to be a subject of a separate article, focusing specifically on the GM and its relations with Uzbekistan. Then, there are problems and risks that all other investors are bound to face. 4. Have the contract released from the customs. The hardest part is to have the local currency converted and customs duties paid. 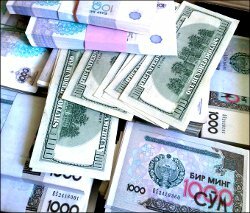 In spite of any governmental declaration there is absolutely no way to exchange Uzbek sums into foreign currency unless, of course, you have very good connections on the very top and are willing to remunerate a high official who patronizes you. Investor is hooked: no conversion means end of business. But even if you get an access to currency conversion it does not follow that all business needs are going to be fully satisfied at any time. Turkish investors who run a supermarket in Tashkent, for instance, were not able to exchange as much currency as they needed or wanted. They were almost forced to purchase foreign currency at the informal market which is a violation of the legislation. Even if you manage to get the currency exchanged and goods imported, you have to go through the next circle of hell, at the customs. Customs rules are complex and confusing. The bottomline is the customs officers value imported goods arbitrarily, regardless of their actual cost, and you have to pay duties as well as taxes based on the customs valuation. Or, you can negotiate your duties with customs officers, unofficially, just as most importers prefer to do. But the worst thing is that often the customs simply deny clearance if instructed so from above. Uzbek government may order that the customs should stop clearing goods in case it finds that imports exceed exports during any given month of a year. The whole system of business and commerce in Uzbekistan is built to force investors into violation of the law. In a way, the Uzbek authorities and the government actually stand behind any violation of the law in the field of foreign trade. 1. Requests to donate to all kinds of charity funds, ranging from the “Makhallya” foundation to “Children’s sports support” fund. Requests are usually made by high officials from the local or national government. 2. Requirements to collect used paper or scrap metal for recycling. Businesses are required to collect a certain amount of materials for recycling, and have it delivered to a pick-up point. Failure to do so entails serious implications. Therefore, some businessmen prefer giving a bribe to a recycling company in order to get a fake receipt. This is easier and cheaper than buying scrap metal and having it delivered to a pick up point. 3. Orders to provide free labor force for seasonal field works. At the time of cotton harvesting most private businesses are obliged to send their personnel to the fields while continuing paying their salaries. No one can evade this obligation, including foreign investors. Even the General Motors of Uzbekistan regularly sends its workers to pick up cotton. 4. Instructions to undertake a side loss-making activity, e.g. a machine-building enterprise can be required to grow vegetables, or create and run a fishery, or a hennery. 5. The fifth and the last category consists of requirements related to a company’s core business. Almost each and every enterprise in Uzbekistan has to achieve certain growth rate, monitored by authorities. Official GDP growth in Uzbekistan is half fabricated and half forced since each and every company, regardless of its field of activity, has to deliver, say 7% of growth per year. Failure to comply entails huge problems with the local government and even the law enforcement. Anecdotally, last year the cabinet of ministers imposed an obligation upon each commercial bank or another prominent company to purchase a certain amount of home appliances, manufactured in Uzbekistan in excess of the existing demand. The government made a plan as to how many TV sets, refrigerators, etc., has to buy each bank or company in Uzbekistan. Another absurd example has to deal with the so called “cost reduction”. This has been started by president Karimov who published a number of articles describing his opinion as to the causes of the global economic crisis and ways to overcome. His main conclusion, widely promoted by the Uzbek authorities, is to economize wherever and whenever possible by reducing costs. Following this recipe, Uzbek authorities have immediately circulated an instruction to reduce costs and followed with a requirement to report the achieved economy. The third major problem of businesses in Uzbekistan is about the direct interference of the state into the pricing policies and market manipulation. Government purposefully develops an artificial shortage of certain goods and materials as a result of foreign exchange problems and import barriers, including metals, copper, oil, cement, etc. The so called “highly-liquid products” can be purchased only at the national commodity exchange. Cement, for instance, has to be traded only via the commodity exchange, following special rules, set by the government. While cement is produced by private companies, the government regulates its sales and event sets its price. The official selling price of a ton of cement set by decree of the president is 95,000 Uzb sum in 2012 (the same is sold at the commodity exchange at 200,000 Uzb sum). Anything above the price is called a “superprofit”, which cement manufacturers have to give to the Reconstruction Fund of Uzbekistan. This Fund is used for all kinds of absurdly expensive projects, like the Palace of Forums and the Palace of Symposiums. Another problem of businessmen and investors in Uzbekistan is the state-supported corruption, arbitrary law enforcement, tortures and unlawful convictions. A few years ago, economic crime was made a jurisdiction of the National security service of Uzbekistan. The NSS has allocated or newly built a whole set of buildings for torturing and intimidating businessmen at the former Konnogvardeyskaya street, which looks more like a fortress. The inner court-yard is filled with impounded luxury vehicles that belonged to former businessmen and prominent investors, serving as a reminder of frailty of any fortune made in Uzbekistan. Just recently, the government supported by the law enforcement and the national security agencies have seized businesses of Turkish investors who owned shopping centers in Tashkent. British and American investors have lost their gold-mining companies. A campaign was organized to seize the business of a cement manufacturer “Bekabadcement”, developed thanks to significant investments from Russia and Kazakhstan. Anyone should recall a nationalization of a dairy and juice producing factory of the Russian Wim-Bill-Dann company after a conflict with the national security service of Uzbekistan and German bakery which was raided by the security forces, taking ambassador of Germany a hostage. All of these are the arguments against investing in Uzbekistan. One thing to remember is that making complaints is no good. Uzbek authorities can do whatever they want and not being afraid of anyone. If you decide to do business in Uzbekistan you do it at your own risk. So, good luck!